The program was sending volunteers into schools, hospitals, and clinics. The volunteers’ intentions were good. The program kept track of their hours. Missing, however, was good data on what impact these volunteers were having on the people they worked with. Langone, meanwhile, was listening to the national conversation about the importance of evidence-based and data-driven volunteer programs. And as a native of Springfield, she disliked hearing negative talk about her city. She wanted to talk about how to solve problems. And as we blogged last year, Langone visited Minnesota to learn more about the program. Guided by the vision that “All Minnesota children will become proficient readers by the end of third grade,” this program sends more than a 1,000 literacy tutors into local schools each year. “Using the latest research on reading intervention strategies and guidance from literacy experts, Reading Corps is a critical link in literacy acquisition. It provides what struggling readers need – individualized, data-driven instruction, one-on-one attention, well-trained tutors, instruction delivered with fidelity, and the frequency and duration necessary for student achievement. A video posted by ServeMinnesota highlights the program’s strengths. “Once we saw it, we’re like ‘we’re doing this,’” Langone said in a recent interview. She came back to Springfield and pitched the idea for a Massachusetts Reading Corps to early education programs in Springfield. People were excited about the model. So Langone started building a program. “With training and technical assistance from ServeMinnesota and additional funding form Springfield’s funder Collaborative for Reading Success and the Irene E. and George A. Davis Foundation, Springfield College launched a replication of the Minnesota Reading Corps Pre-K model in 2012 with 12 literacy tutors placed at the Mason Square Head Start, Square One, and Margaret C. Ells Elementary School,” the website for the Massachusetts Reading Corps says. Tutors who work half-time — 20 hours per week — earn $605 per month. Their salaries are supported by grant funds. Tutors also receive educational awards of $2,865. This money can be used to pay state loans or tuition bills. 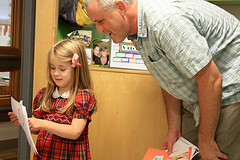 Older volunteers can transfer their education awards to children and grandchildren. Langone says that some 80 percent of volunteers are students. The rest are community members. Three key elements of the program are training, mentoring, and assessment of children’s progress. Internal coaches mentor literacy tutors. And master coaches oversee the work of the internal coaches and the tutors to be sure that the reading corps model is being implemented with “100 percent fidelity,” Langone says. To understand how children are doing, the tutors administer assessments that are age-appropriate and socially and emotionally suitable for children. The assessments are like games, Langone stresses, not standardized tests or literacy drills. The tutors also help create literacy-rich schedules. Walk into a classroom with a tutor and you might see children rhyming words as they wash their hands or playing an alliteration game during snack time. In addition to benefitting from the tutors’ help, teachers also get professional experience using data on children’s progress to guide their teaching. The reading corps program can also extend early educators’ career paths. Langone points to Elizabeth Miller, a former pre-K teacher who is now a Massachusetts Reading Corps master coach. And some tutors go on to teach, including Keri Cecilia, who is featured in a WGBY report. Cecilia graduated from Springfield College in 2013, joined Teach for America, and became a teacher in Baltimore. Next school year, Langone expects that reading corps tutors will be in a number of new classrooms, thanks to federal Pre-K Expansion grants. This will help the program grow from 25 classrooms this year to a total of 30 next year. If there are no school staff members available to fill the role of internal coach, the schools may incur cost for having Massachusetts Reading Corps tutors. So one challenge is to maintain high quality as well as affordability for schools. A school with two tutors would have to spend approximately $6,000 per year to hire an internal coach who could provide instructional support and guidance.